When it comes to securing your website, online business or mail server, relying on a password and prayers just isn't enough. To guarantee that the connection between server and client is as secure as possible, SSL (Secure Sockets Layer) or TLS (Transport Layer Security) establishes an encrypted link to ensure sensitive information such as credit card numbers, social security numbers, and login credentials can be transmitted securely. 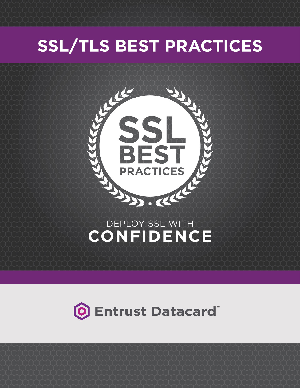 Entrust’s SSL Best Practices Guide is our ongoing effort to provide comprehensive coverage about new threats and vulnerabilities to SSL/TLS, with tips on how you can use SSL effectively. Our guide is designed to help make SSL/TLS certificate installation easier, so you can use SSL expertly and with confidence.